H. Moser & Cie. exhibits entrepreneurial flair with the creation of the Venturer Tourbillon Dual Time, an elegant watch bringing together very rare elements. The automatic manufacture calibre HMC 802 uses the first tourbillon ever developed by H. Moser & Cie. This tourbillon is like no other thanks to two ingenious features invented by H. Moser & Cie. Firstly, the state-of-the-art Straumann Double Hairspring® further improves the accuracy and isochronism of the new in-house manufacture movement. 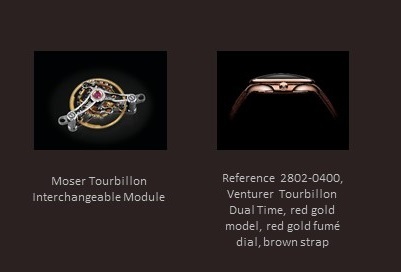 Secondly, the Moser Interchangeable Tourbillon Module facilitates servicing with a unique construction. The result: the perfect combination of elegant and functional design, to be revealed in September 2014.